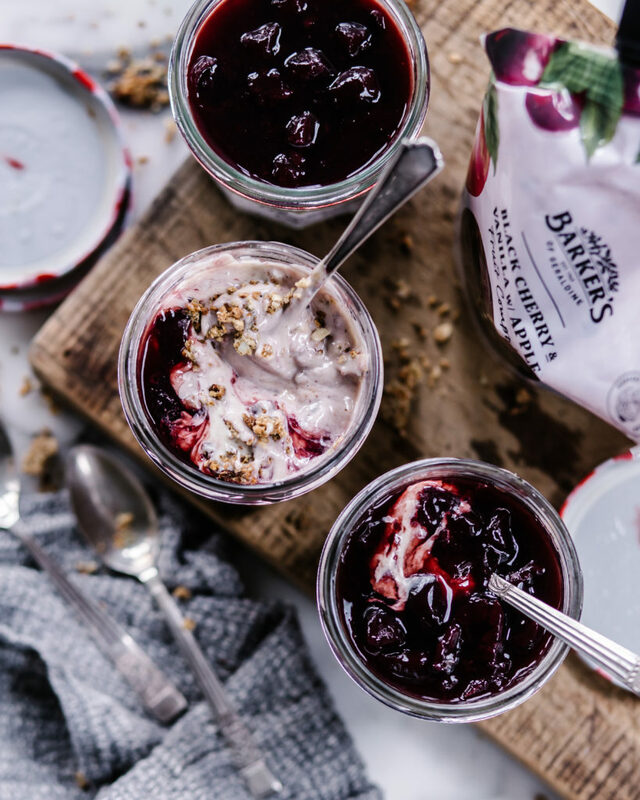 ﻿ Vegan Cheesecake Parfait - I AM Co.
Barker’s of Geraldine have crafted these delicious fruit compotes made from carefully selected varietals. Perfect to use for breakfasts, baking and desserts with a no mess spout pouch which brings convenience to your kitchen. Find the range of compotes in the canned fruit section of your local New World and Pak n Save stores, or the dessert topping aisle of your local Countdown supermarket. Preheat oven to 180 deg Celsius. Place the rolled oats, sunflower seeds, pumpkin seeds & maple syrup into a food processor and pulse until combined and coarsely chopped. You are not after a fine crumb. Spread onto a baking tray and bake for 30 minutes or until golden. Clean the food processor and add all remaining ingredients except the compote. Combine until a smooth consistency is reached. Layer the cooked seed base in the bottom of a glass, followed by the cheesecake mixture, topped with compote. Chill for 1 hour prior to serving.